On Sunday I should have been at the WAY Big Picnic, locally held at the new Queen Elizabeth Olympic Park. Briefly I was, arriving with Heather, Gemma and other WAYers to at least find the picnic spot and set up. 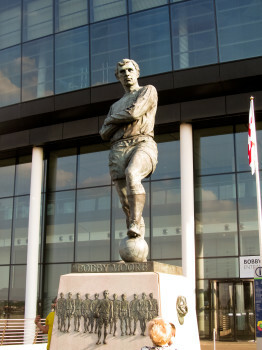 I then had to leave before most of the party arrived though, to head back over the other side of London to Wembley. 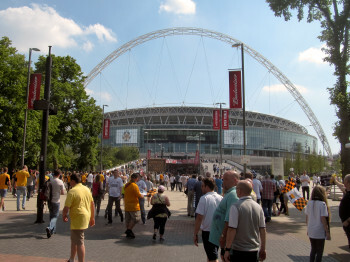 I was at Wembley to watch Cambridge United play Gateshead in the conference play-off final. Impressions of Wembley are its big but lacks a bit of character. Like most modern stadia there’s nothing to distinguish one part from another, no quirky stands or favourite corners here. It also has a corporate “venue” feel (football grounds aren’t venues, they’re churches and cathedrals), right down to the metal decking beneath the seats which gave the impression of versatility more than actually caring about details of the ground. There’s never enough bar space open either! Please can we have safe standing areas at football. Please. A steward attempted to get us to sit down once first half and twice second, to be pretty much laughed away each time. I remember Hillsborough happening; the last thing I want is people packed into terraces behind big fences again. But safe standing works, and gives a choice for those of us who instinctively stand versus the (strange) people who wish to sit. The fact that stewards are complaining about standing but apparently managed to let someone bring a smoke bomb in tells you how confused the priorities are. 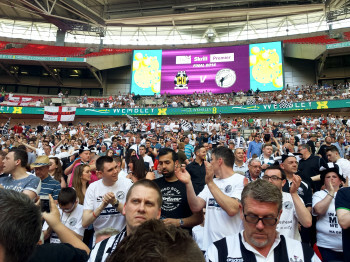 Unfortunately, despite the vocal support of the out numbered Heed Army, Gateshead couldn’t correct the 54-year-old injustice of being un-elected from league football, falling 2–1. The players undoubtedly gave their all, and arguably deserved extra-time, but it was not to be (possibly undone by a reluctance to get the ball in the box or shoot from outside meaning their at times dominant possession didn’t produce much in the way of chances until behind). After that disappointment it was back across London to help carry things away from the picnic, having missed the whole thing! Ah well, next season! Match action here—in theory I should be in the crowd near the front somewhere behind the goal. I was Disappointed. I was at London. I was listening to Heed Army, Heed Army. The post Wembley Way was first published on Tuesday 20th May 2014 at 10:01 pm .